A brutal prison drama, Midnight Express is a grim descent into the nightmare of foreign land captivity at its worst. Billy Hayes (Brad Davis), a young American tourist in Istanbul, attempts to smuggle some hashish out of the country to sell to his friends back home. 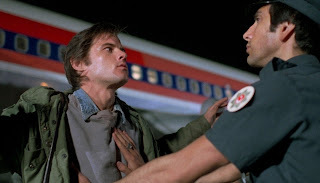 He is caught at the airport, and receives no help from mysterious American agent Tex (Bo Hopkins). The Turkish authorities are eager to make an example of him: he is tried and sentenced to spend years in a decrepit, overcrowded prison. The head prison guard is the brutal Hamidou (Paul L. Smith), and Billy survives by making friends with fellow foreign prisoners, including the excitable Jimmy (Randy Quaid), the laid back and friendly Erich (Norbert Weisser) and the elderly Max (John Hurt). Despite the interventions of his father (Mike Kellin) and a sweaty local lawyer, all attempts to secure Billy's freedom fail. Worse is to come, when after years in captivity his release date is shockingly pushed back. Billy and the fellow prisoners start plotting escape plans, but life in prison will take every bad turn possible. At Billy's lowest point, a visit from his girlfriend Susan (Irene Miracle) proves to be a turning point. Directed by Alan Parker and based on Hayes' real-life experiences, Midnight Express makes for harrowing viewing. Billy's adventure is not for the faint hearted. This is a story of overzealous local authorities sending a message to the international drug smuggling community by throwing the book at a young man, and what follows in terms of physical and emotional torture is difficult to take. The film's trajectory is linear and unrelenting. Once Billy falls into the hands of the Turkish authorities there is no escaping the cascading horrific events that follow. There are frequent physical beatings, humiliation and isolation, all in a filthy environment controlled by sadistic guards. The layered cruelty coupled with hopelessness inevitably lead to a slow descent into madness, and Parker never flinches from placing all elements of the agonizing journey on the screen. Oliver Stone wrote the script (adapting Hayes' book), and takes all possible liberties to make Billy as sympathetic as possible, in the process turning the entire Turkish nation into a cesspool of villainy. The valid criticism of the film is the sharp definition between the foreign prisoners as all worthy of empathy and the portrayal of every Turkish character, from judges and lawyers to guards and prisoners, as corrupt, mean, barbarous, conniving and backstabbing rapists. In addition to prison head guard Hamidou, local prisoner Rifki (Paolo Bonacelli) is a despicable weasel inside the walls, and embodies the worst of what Stone wants to portray about Turkey. Brad Davis does well in the central role of Billy Hayes, finding the right amounts of determination, intensity and rage. The supporting cast is fragmented, although John Hurt leaves a mark as the seemingly perpetually doped prisoner Max. Almost physically painful to watch, Midnight Express is an uncompromising cautionary tale delivered with unblinking fervour.